* This post is in collaboration with Mt. Rainier Railroad. I received tickets for the Polar Express in exchange for a review. All opinions are my own. Thanksgiving is just a few days away and then it's full steam ahead to Christmas time. 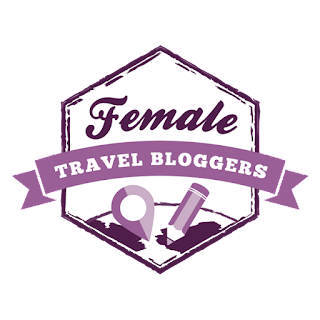 Speaking of full steam ahead, I'm so excited to tell you about this magical train ride! Mt. 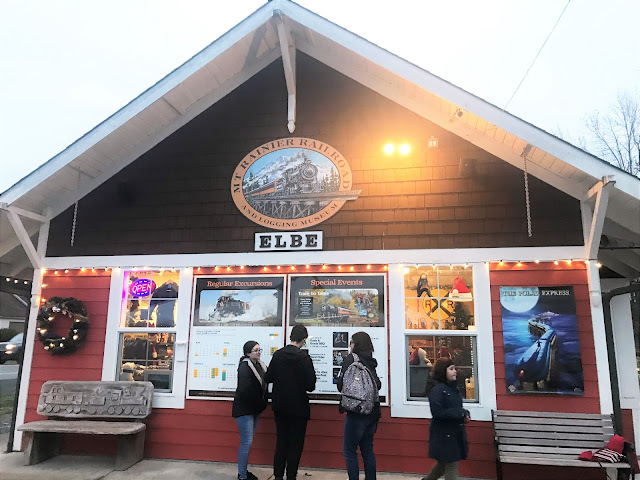 Rainier Railroad is located in Elbe WA. ALL ABOARD for the ride to the North Pole! 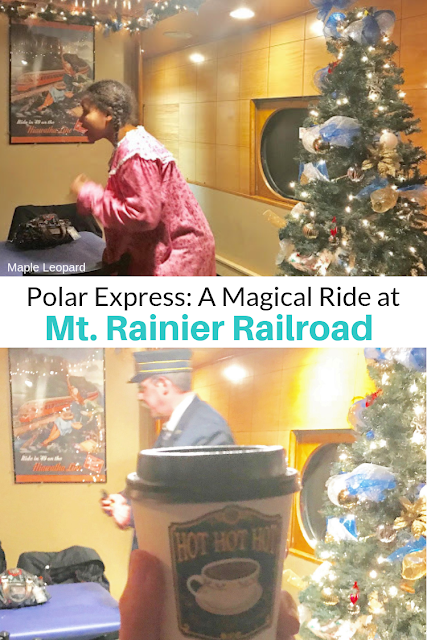 Last Thursday night we were invited to ride the train for the dress rehearsal of the Polar Express. What an amazing time it was meeting all the characters of the original movie and Santa himself! 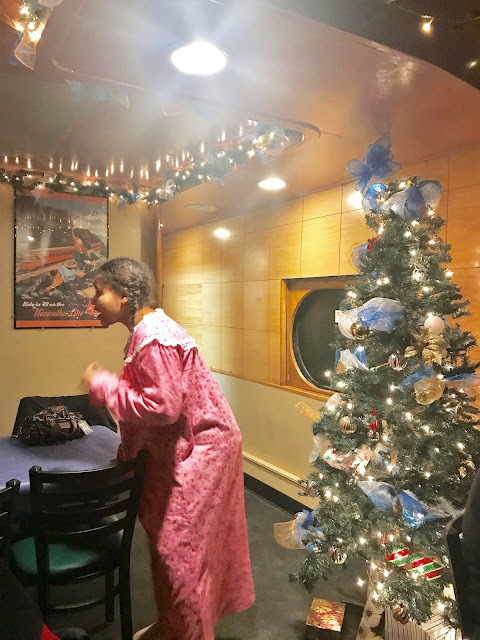 If you get the chance to experience holiday magic on the Polar Express: do make sure you dress the part, it adds so much fun to the excursion! Many of the kiddos on the train and their parents wore their holiday PJ's. 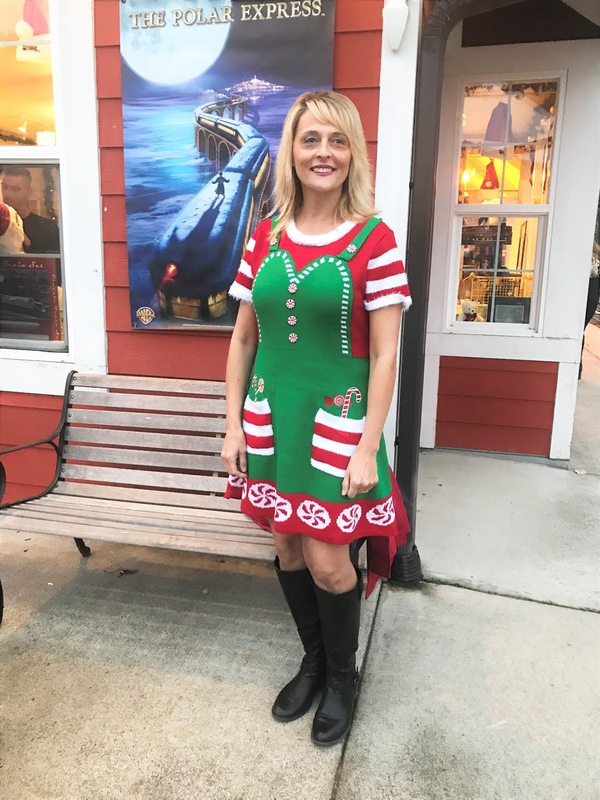 Others were dressed in sparkly holiday clothes in shades of red and green. I was hoping Santa would add me to his team so I arrived in my elf outfit! If your family decides to wear PJ's for the ride: you can find the perfect ones at the museum shop online. 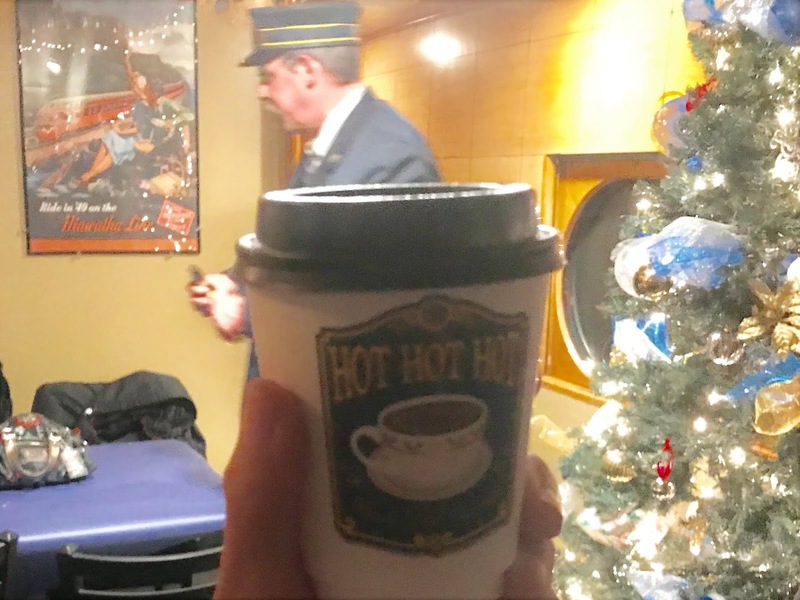 The Polar Express Train Ride is in it's 3rd year of operation. 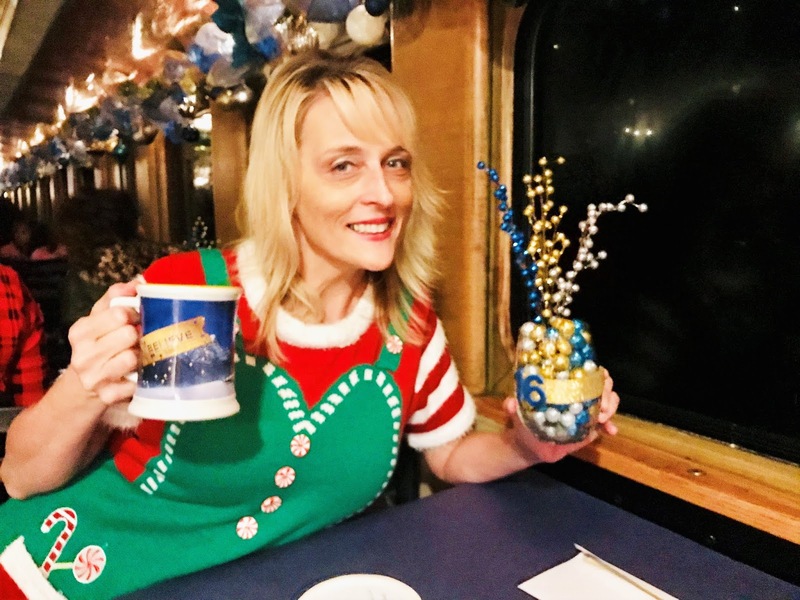 Every year over 40,000 guests hop on board for this premier holiday event. Mt. Rainier Railroad promises a very interactive theatrical experience. Mt. Rainier Railroad and Logging Museum is located 45 minutes south of Tacoma. As passengers, we engaged with the characters and relived the events of story told in children's book and Academy Award winning film. For the duration of the 90 minute ride, there was lots of laughter and screams of delight!
" Click click click click click "the chads went airborne as the conductor stopped at each table and punched each ticket. He really made the ride so realistic! All of the characters did an amazing job bringing the story of the Polar Express to life. I'm sure every child on the train that night, thought they were truly being transported to the North Pole. I think most of the adults were almost convinced as well, ha! I had a hard time coming back to reality after the ride. Once the train gets on the way, everyone is treated to yummy hot chocolate and a sugar cookie. 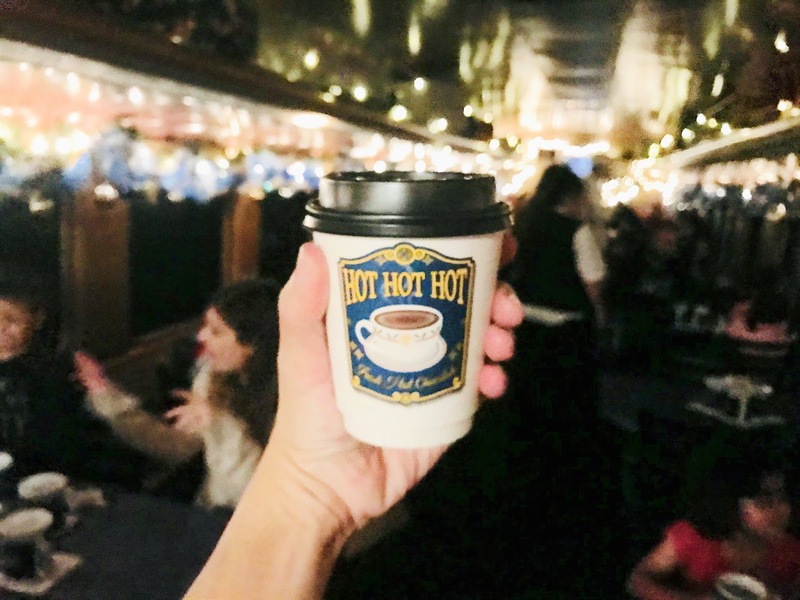 While you sip away, the chef and waiters dance up and down the aisle with the "Hot Chocolate" song booming in the background. After the drinks are passed out they read the story of the Polar Express from huge picture books. This is was my favorite part of the night, so much fun and excitement! It was great to be like a kid again, if even for just a few hours. At the end of the line is the grand, snowy North Pole. Santa, Mrs. Claus and all the gang can be seen waving and standing by to hop on. On the trip back, Santa Claus is on board to greet passengers and give each child the first gift of Christmas: a silver bell. I was unable to get a clear photo of our white bearded friend, the lights were too dim . 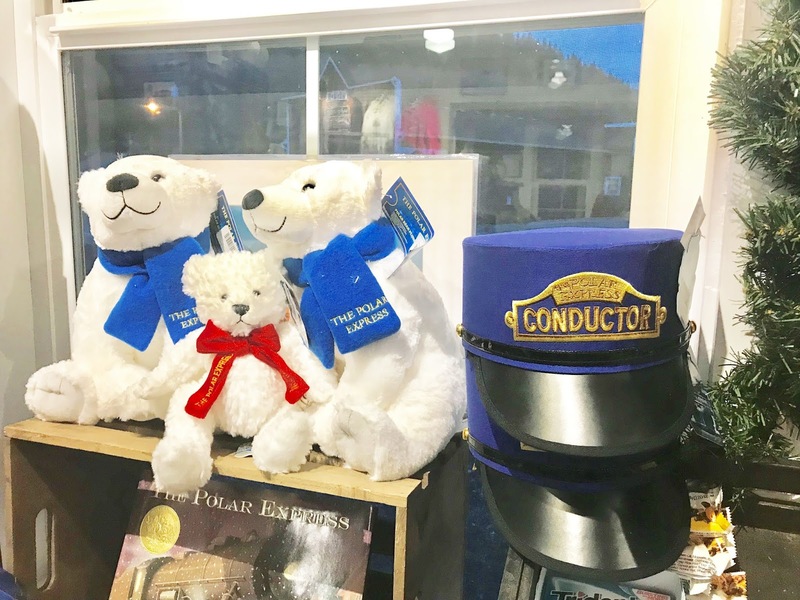 After the Polar Express train arrives back at the depot, stop in at the gift shop. 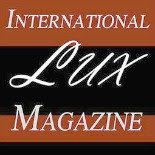 Here you can find treasures and trinkets to commemorate your fun experience. The railroad and museum are part of the American Heritage Railways network, and are managed by the Allen C. Harper family. 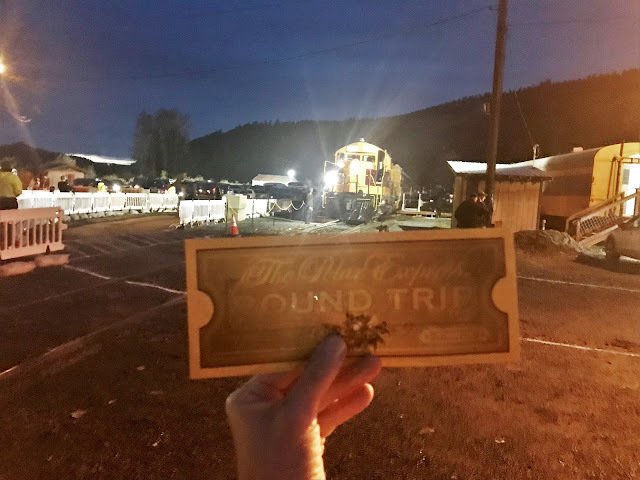 AHR also owns and operates: Durango and Silverton Railroad in Durango, CO; the Great Smoky Mountains Railroad in Bryson City North Carolina; the Grand Imperial Hotel in Silverton CO; and Rail Events Inc. The railroad at Mt. Rainier is growing a portfolio of very popular specialty events. Excursions are available at other holiday times such as: Easter, Mother's Day, Father's Day and Halloween. ( The Great Pumpkin Patch Express). Follow Mt. Rainier Railroad events page to stay in the know. I hope you get the chance to ride the Polar Express this holiday season. Collecting experiences rather than things, is what the holidays are all about. This experience will be one I keep in my heart for many years to come! Happy Thanksgiving and holidays to you and yours. Do you have any fun holiday events planned this year? The Adirondack Scenic Railroad also does a Polar Express! I’m counting down the days until we go! Awesome, hope you have the best time..It was my first time on any such ride..Amazing! Oh wow - how much fun! Wish I lived closer to a place that does this - Mt. Rainier area is so pretty! Awe Ali, yes Mt. Rainier area is just so stunning, maybe you can make it next year, have an amazing holiday! Now this looks like a LOT of fun!! I would love to take a ride on the Polar Express one day!! I hope you can Ricci, such a great memorable experience! Great photos! Your outfit is so fun. I totally agree that we should collect experiences, not things. My boyfriend and I are visiting my parents this Thanksgiving weekend and I also get a chance to see cousins that I haven't seen in years. Although the occasion is sad -- my grandmother's funeral -- it will be nice to catch up with everyone. Awe sorry to hear about your Grandpa, but glad you get to see family for the holidays! As I get older, I care less and less about Things and more about experiences gained by travelling! Happy Holidays! We did this last year with our neighbors and it's such a cute event! Definitely recommended dressing up in holiday jammies for extra cute photos! That's cool Marcie you did it with your neighbors, how fun!! Thank you so much, its a very fun experience for the season! Wow! This sounds so much fun. I have only been on one such train ever, the Hogwarts Express. And I loved it. I am sure my kiddo and I will have a great time on this one. Even I was transported to the Polar Express world while reading through your post. Indeed, a great read. And loved your outfit by the way!